I just received these beautiful greeting cards with the image of my “It’s Time for Colour” quilt donation – Chrysalis Awakening. 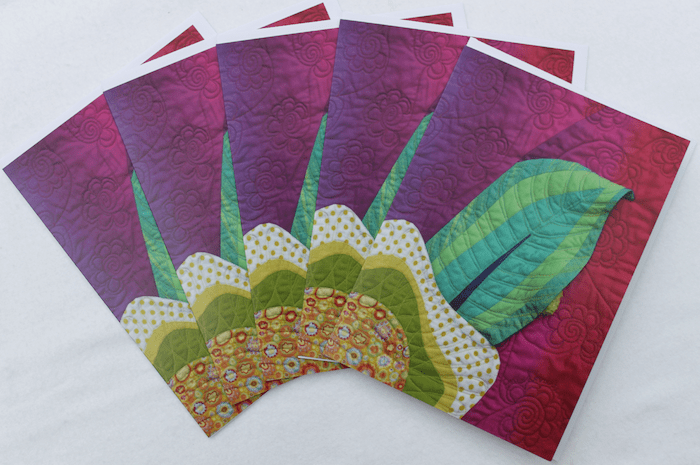 Every quilt has been photographed and the images put onto a set of wonderful greeting cards. You can see all the gorgeous quilts at the Canadian Quilting Association blog: It’s Time For Colour Gallery. All proceeds will go the Children’s Wish Foundation. Some of the quilts have been purchased and these one-of-a-kind art quilts will find their way to their new owners next year. So, if the piece you love has been sold, you can still purchase the greeting card. Contact Laine Canivet at membership@canadianquilter.com for more information. These blank cards make great gifts!